Inspirational devotions can be a great tool used to enhance your own walk with God, or to enable you to help others draw closer to Him. On this particular page, I want to talk a bit about devotional books to use in your personal devotions. If you're looking for ideas for devotions you can give for your next talk, I'll give you some ideas and devotional ideas soon. I have to admit that for many years I wasn't one to read "devotional" type books. 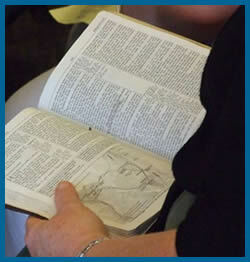 I always preferred to just read the Bible and allow the Holy Spirit to teach me as I read. 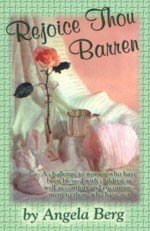 I'm not suggesting that you substitute devotional books for pure Bible reading and meditation, but I've discovered over the years that there are some really wonderful books of inspirational devotions that can be used in conjunction with my Bible reading to get me considering things I might not have thought of before. 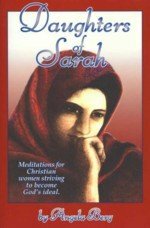 Surprisingly, I even eventually wrote Daughters of Sarah as one of my first devotional books for women in an effort to encourage my sisters in Christ. It seems like life gets busier and busier these days and it's so easy to allow the day to get away from us without taking the time to have a quiet few moments with the Lord. 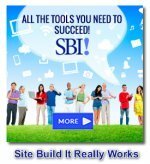 Do you find it as challenging as I do? For me, if I don't make time first thing in the morning to spend time reading my Bible and having my "personal devotions," there's a good chance that the day will be done and I will have completely neglected spending some quiet time with the Lord. One of the best disciplines that I gained during my years in Bible college was to take more seriously that quiet time with God and preciously guard it with serious commitment. 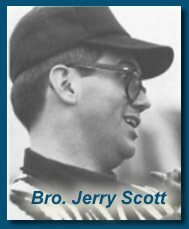 One of the college staff (and a dear personal friend of ours), Brother Jerry Scott, was also one of our favorite preachers during the daily chapel services. I'll never forget the day he gave testimony of how he had lost one of his eyes. Because of his loss, it made the vision in his remaining eye that much more precious to him. He told us about the day he got serious with God about his commitment to spend time with Him each day. He promised the Lord that he wouldn't eat anything each day before he ate spiritual food (spent time in Bible reading and prayer). He told the Lord that if he failed to keep this commitment, he wanted God to take his other eye! I was amazed and challenged by the importance he placed on keeping that close relationship with the Lord. I decided to make a similar commitment. No, I didn't ask the Lord to take my sight, but I chose something that was personal to me and committed to reading my Bible daily before deliberately eating any physical food. I've had to delay eating a few times over the years, but I've been able to keep this commitment to the Lord, and I believe it has really helped me to ensure I spend time with Him. Sometimes the quality of that time was not always the best, but I know that I am better off with poor quality fellowship on occasion rather than no quantity, if that makes sense! There are some wonderful writings that can stir your thinking and lead you to deeper meditation during your daily devotions. There are a few that have really spoken to my heart and, I believe, drawn me closer to the Savior. Here are some of my favorite books of inspirational devotions that you might enjoy reading as well.